Having a small character LCD hooked up to a computer isn’t really a novel idea. They became popular on servers, which often run without monitors attached, to convey vital system status information to technicians. In more recent years, they have become popular in custom-built PCs. I wanted one on my desk because there are often small notifications that I want to be accessible at all times, but not the center of my attention. On-screen notifications, such as icons in the GNOME panel, the Windows system tray, or Growl on Mac OS X work fairly well, but only if I’m sitting at my computer and have the monitors turned on. An external notification device is able to convey this information without a large display. I could have purchased a pre-built unit; they exist both as displays that fit into an empty expansion bay on the front of a PC, or separate desktop units. However, my aesthetics don’t always match up with the PC-modding community (I tend to prefer things simple and understated rather than bright and flashy; I don’t want my PC to look like the typical “gaming rig”). Building things yourself is great because you get to decide exactly how it’s going to look and work. I also chose to add 3 RGB LEDs to the device—many small bits of information are binary, such as having a new e-mail message. The LEDs provide a great way to convey information like this, and they’re meaningful from across the room. Using RGB LEDs makes them customizable, or allows information to be encoded in the color of the indicators. Rather than designing a custom PCB and fabricating a custom enclosure, I decided that I’d put together the Message Box as a true weekend project, using only materials I had around in the parts bin. The enclosure that I chose is the plastic box that Apple uses to package their chargers for the iPhone/iPod touch. It was perfect for re-use in a project like this. I started by cutting a piece of perfboard to fit the inside of the box. I drilled four holes in the corners of the board and the box so that the board could be mounted on standoffs. I soldered a USB mini-B jack to the edge of the board, then drilled and filed out an opening for it in the plastic. After confirming the fit of the board in the box, I placed all of the large components on the board: the LCD, the ATmega168, and the 3 LEDs. I checked the fit in the box and then soldered them down. The FTDI chip that I used to provide the USB interface is only available in surface-mount form. There’s a nice evaluation board with the chip and a USB port on it that I’ve used before in other projects, but I didn’t have any sitting around. 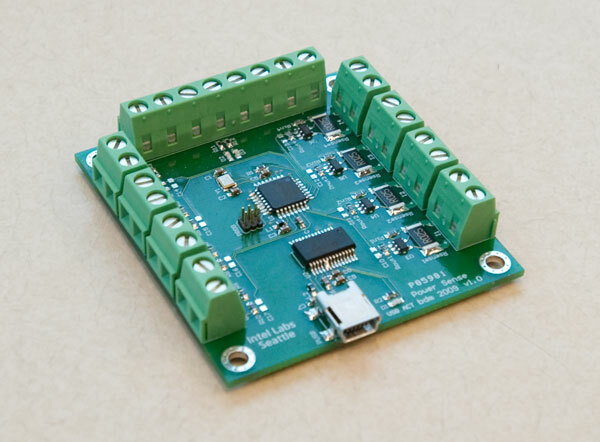 The prefabricated evaluation board also adds about $20 to a project, where the chip itself and a USB connector can be sourced for a couple of bucks. To use the surface mount chip, I placed a piece of Kapton tape on the bottom of the perfboard to keep the pads from shorting out the pins on the chip, and epoxied the chip to the tape. The whole board is wired point-to-point using 30-gauge wire. Soldering the wire directly to the pins of the chip takes a reasonably fine iron tip and a little bit of practice, but it’s really not bad once you get the hang of it. The USB jack and FTDI chip. I then proceeded to wire up the rest of the board. For the passive components, I used 0603-size surface mount resistors and capacitors. These are actually great for point-to-point work like this, because they fit perfectly between pins with the standard 100-mil through-hole spacing. The bypass capacitors fit neatly between the power and ground pins on the chips, and the LED resistors take up hardly any space at all. You just need a good pair of tweezers for placing them accurately. Point-to-point wiring on the back side of the board. I wrote the firmware for the device in C, using the avr-gcc toolchain. There is a 6-pin ISP socket on the back of the board to enable the microcontroller to be programmed. The device appears under Linux as a standard USB serial port (/dev/ttyUSB0). I set up the protocol so that any text written to the port appears on the display. I also implemented a very limited subset of the VT100 terminal command set for operations such as clearing the display and positioning the cursor. To control the LEDs, I added a few custom escape sequences. On the PC end, I wrote a Python script that updates the information on the display. It periodically polls a variety of sources such as RSS feeds, e-mail inbox message counts, instant message clients, and music players, and then updates the text on the LCD and the state of the LEDs accordingly. The Message Box is a great little device; I’m glad I spent the time building it. I’m still tweaking the code to make it do different things and customize the functionality, but that’s what’s great about having a custom-built solution—in the end, it will do exactly what I want it to do. This entry was posted in Hardware on November 24, 2009 by bmayton. In order to construct Intel Labs Seattle’s mobile robotics platform, MARVIN, I needed to build a power system to supply the DC voltages required by the different components of the system. I used nickel-metal hydride battery packs as the battery power source and VICOR DC-DC converters to provide the various required voltages. The control panel on the rear of the robot is laser-cut acrylic and provides control over battery power, battery chargers, power to individual system components, and battery current and voltage monitoring. One of the important features of the design is an onboard AC to DC power supply. This allows the robot to run indefinitely from a single tether, which plugs into a standard electrical outlet; no external power supply is needed. The system switches seamlessly between wall and battery power when wall power is connected or disconnected, so no part of the system needs to be shut down to connect or disconnect power. 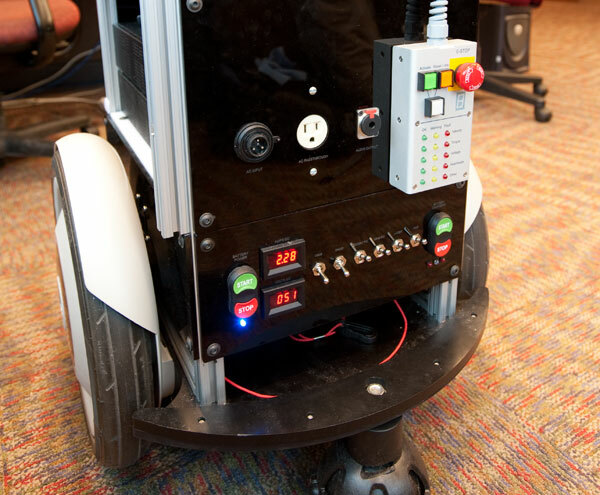 Onboard chargers enable the robot to recharge its batteries while it is plugged in. MARVIN’s rear control panel. Power module controls are at the bottom. Inside the power module while I was constructing it. DC-DC converters and solid state relay are mounted on an aluminum side panel for heatsinking. Fuses, relays for the switching/interlock logic, and screw terminals for easy connection of peripherals are mounted on the bottom plate. Batteries will fill most of the empty space. UW Classroom Presenter, developed by Richard Anderson et al. at the University of Washington, is interactive presentation software that runs on tablet PCs. Each student uses his or her own tablet PC, can see written annotations made on the slide by the instructor (called “ink”) and can add his or her own ink to slides which can be submitted back to the instructor to be reviewed or shared with the class. In my undergraduate capstone project at the University of Washington, I worked with several other students to develop a version of Classroom Presenter that runs on the One Laptop Per Child foundation’s XO laptop. The software is not just a port but a complete adaptation to make it usable on the XO. The XO is not a tablet, so only simple drawing with the trackpad (or a mouse) is possible. We added text input features to enable students to provide a textual response to a question without needing to write it with a mouse. We use the XO’s built-in facilities for discovering shared activities and connecting to other machines, so that connecting the machines together is simple enough for elementary students to do themselves. We also included features necessary for setups that don’t include a projector: the original UW Classroom Presenter expects that if the teacher wants to share a student’s submission with the class, he or she will use a projector to display it. In our implementation, we enable the teacher to broadcast selected student submissions to the rest of the class, so students may view them on their own screens. The project culminated in a trial at a local elementary school, where students in small groups shared XO laptops to complete activities about a recent field trip, while the teacher talked about the students’ work and shared their submissions with the rest of the class. The results of the trial were very positive; we received great feedback both from the teacher and from his students. The source code we developed has been made available under an open source license. This entry was posted in Research on November 24, 2009 by bmayton. In the autumn of 2004, I moved to Seattle to attend the University of Washington. I began taking photos to share some of the neat places I discovered while exploring the areas around campus with my family and friends back at home. I started with a pocket-sized point-and-shoot digital camera, back when they were starting to become popular. As I learned more about the art and science of photography, I’ve moved on to cameras and lenses that afford better manual control. I still enjoy taking walks around the beautiful University of Washington campus on weekends and capturing some of the scenery. Most of my earlier work is posted on my blog, Ordered Pixels. More recently, I’ve been using flickr to organize and share my photos. A few selected shots are shown below. In addition to my hobby photography, I often take photos of my own and others’ work at Intel Labs Seattle. My photos have been featured in various promotional materials, posters, presentations, papers, and technical documentation. Marvin the Mobile Manipulation Platform and iPhone control application. Used in promotional materials and presentations. Intel Wireless Identification and Sensing Platform (WISP). Used in promotional materials. This entry was posted in Photography on November 23, 2009 by bmayton. I designed this board to monitor the power system in Intel Labs Seattle’s mobile robotics platform. It provides four current and four voltage measurements, and interfaces with a PC via USB. Readings for all of the channels can be read at over 100 Hz. This entry was posted in Hardware on November 23, 2009 by bmayton.